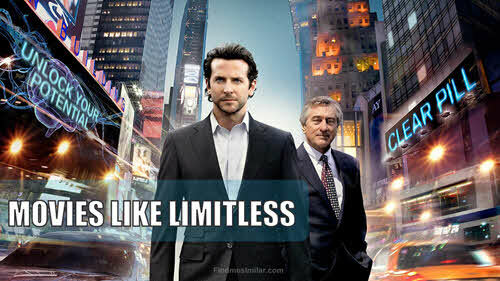 Movies Like Limitless: Find Your Brain Limits '+g+"
Limitless is a 2011 science fiction thriller directed by Neil Burger. The story follows Eddie Morra (Bradley Cooper) a struggling writer who becomes target to some of the most dangerous men around the world when an experimental drug called NZT enables him to access extraordinary mental abilities. Like watching science fiction thriller movies like Limitless (2011)? then check out this list of recommendations below for more movies similar to Limitless (2011) and don't forget to mention if we miss any other similar films as we keep on updating this list. Lucy is a 2014 science fiction action-thriller written and directed by Luc Besson. The movie follows Lucy (Scarlett Johansson) who accidentally acquires supernatural powers due to synthetic drug (CPH4) turns the tables on her captors. Source Code is a 2011 science fiction time-travel film directed by Duncan Jones. The movie follows Captain Colter Stevens (Jake Gyllenhaal) who awakes in the body of a train commuter as an experimental government program called the “Source Code” must find the bomber of a commuter train within 8 minutes to prevent a second terrorist attack. Gattaca is a 1997 science fiction directed by Andrew Niccol. The movie follows Vincent Freeman (Ethan Hawke) an genetically inferior man assumes the identity of a genetic elite to pursue his dream of space travel with the Gattaca Aerospace Corporation. Transcendence is a 2014 science fiction action thriller directed Wally Pfister. The movie is about Dr.Will Caster (Johnny Depp) a scientist whose pursuit of artificial intelligence takes a dangerous turn when his consciousness is uploaded into a sentient machine that combines the collective intelligence of everything ever known with the full range of human emotions. The Butterfly Effect is a 2004 science fiction thriller directed by Eric Bress and Mackye Gruber. The movie follows Evan (Ashton Kutcher) a young man with troubled childhood discovers the ability to travel back in time and uses it to change the future of him and his friends. Little Man Tate (1991),....if you can think of more, then don't forget to mention them in comments.